Check it out! This may look like your run-of-the-mill closet, but guess what–it’s organized! At least a couple of times a year I do this. I sort my clothes according to type: pants, tops, skirts, dresses, etc. It gets a little more specific than that, but mostly it involves putting like-items together in my own self-imposed categories. It helps me figure out what needs to stay, what needs to go, and how I can mix and match the keepers in new ways. Before you think I’m a complete neat freak, after a couple of weeks I usually get lazy and hang things up anywhere. Still, it gives me a good baseline to work from, and I usually uncover things I haven’t worn in a while that make it back into my everyday wardrobe. 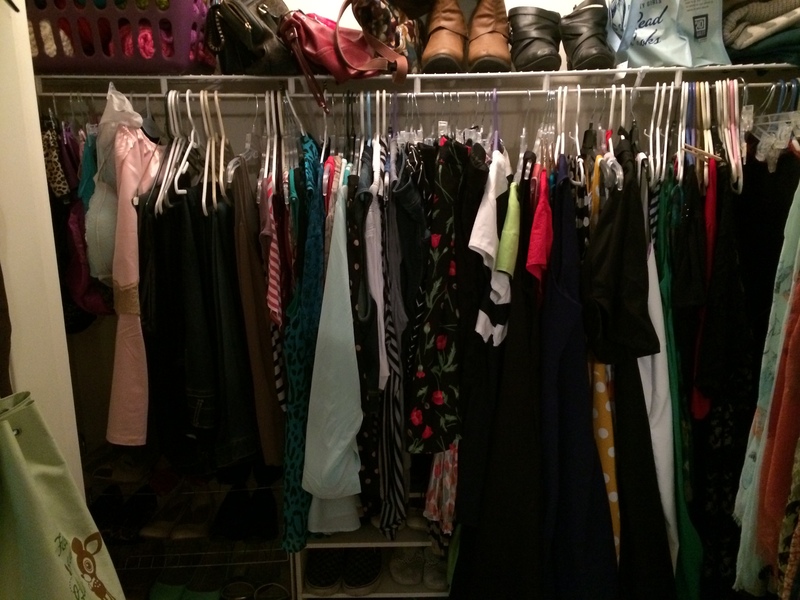 This was my first time organizing my closet since I’ve started blogging, and let me tell you, it was an eye-opener. Now, I know I’ve been buying a lot of clothes lately, but there’s something about seeing all of those little darlin’s lined up on hangers that can really make a girl have a real “come to Jesus” moment. I know Carrie Bradshaw (to paraphrase) likes her money hanging in her closet right where she can see it, but Carrie wasn’t living out of a bedroom in her parents’ house working a retail job. I can blame blogging, but really it’s just another scapegoat to rationalize an out-of-control shopping habit. Sure, in the moment I click “Checkout,” I think, At least I’ll wear it in the blog, but really, for the last few months, it was just fun to get new things. While I don’t have a boyfriend-boyfriend, clothes became my “boyfriend” while I also have been gettin’ some on the side with records, make-up, accessories, knitting, Instagram, and belly dancing. Basically, I just need to stop being so slutty. Not that any of these interests are bad, but I definitely need to slow my roll in a few areas of my life. 1- From today through July 31 – No new clothes, no new make-up, no new jewelry or accessories, no new shoes, and no new belly dancing costume pieces. After my current orders come in, no more ’til August, and only then if I need it. 2- The only exception to #1 is Gwynnie Bee. I recently started a two-garment-out-at-a-time free trial, and I’m not sure how it will go since I don’t know how the sizing runs on many of many of the brands they carry, but I will allow myself to buy something from them if I like what they send me, but that’s it. 3- No new yarn, no CDs, no iTunes. I have tons of yarn already, and I haven’t even listened to all the music I own. I am allowed to buy two new records per paycheck. I am only human. But what about the blog!? The blog will be just fine. I actually think my over-shopping has been taking me farther away from my initial mission and reason for starting Super Style Me in the first place which is developing a personal style through many means–shopping for new things only being one of them. Notice that I haven’t had a DIY project posted in a while? Exactly. I lost my way even this early in the game. Also, I want to learn more about the business end of blogging, but I’ve been a little afraid of moving forward. It’s an easy cycle to fall into to get dressed up, take some pictures, and post an outfit every few days; however, doing that and only that over and over is keeping me from growing this little venture into what it truly can be. That being said, I still have many things I’ve bought in the last few weeks that haven’t made it on the blog yet, so I have potential outfit posts for weeks. Also, I love it when bloggers repeat garments in inventive ways. Rebecca, The Clothes Horse is one of the first fashion blogs I’ve followed, and in her Sunday Remix, she shows how certain pieces reappear in her daily outfits even after years of blogging. I believe this very concept is great for everyone, and it could work well for the plus-size community because we unfortunately don’t always have the variety of clothing as standard sizes do. Why not show multiple ways to wear the same thing? I’ve also been taking a look at the One Suitcase Series on Outfit Posts. While this advice is meant more for what to wear while traveling, I think there are many good takeaways for mixing and matching your wardrobe for seasonal and lifestyle purposes. Hopefully, my little shopping break will help me re-imagine my closet and my blog. Sometimes when faced with limitations, we become our most creative selves, and money can’t buy that! Thanks for sticking with me while I figure it all out. I promise, it will be fun! Definitely! I’m hoping it all works out! Thanks!